(The Malay Mail) - PAKATAN RAKYAT (PR) leader Datuk Seri Anwar Ibrahim confirms that Penang will see straight fights between the coalition and Barisan Nasional (BN) in the 13th general election. Speaking to journalists after making a courtesy call on Chief Minister Lim Guan Eng at the state administration centre in Komtar today, Anwar said the seat PR allocation was almost complete with just one or two seats still being deliberated between PAS and PKR. “Our seat allocation among the three parties here is ninety per cent complete and the status quo of the 2008 election remains. However, there is still dispute over one extra seat. That seat is contentious because it is being coveted by PAS and PKR. “But in the spirit of PR normally all three parties would be involved in the sense that DAP would have to be made aware of the issue, although in the end the issue would have to be resolved between PAS and PKR. “Umno is praying that there would be a split (between the three parties) but we will prove them wrong. 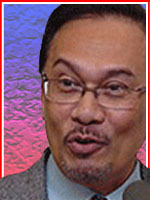 So, I can say there would not be a two party contest within PR here,” said Anwar who is defacto PKR head. Anwar’s statement seemed to have quelled speculations stemming from leaked meeting minutes between Penang PKR chief Datuk Mansor Othman and PKR leaders. In the meeting held in March, Mansor was alleged to have asked his state vice chair Law Choo Kiang to draw up an extra list of candidates for several seats in the off-chance DAP or PAS was adamant at fielding its people on present PKR seats. Since 2008, PAS has been making strong efforts to reclaim the Sungai Acheh state seat on the mainland which the party traditionally contests in but loses to BN in every general election. However, after sacrificing that seat to PKR, who again lost, in the last election, PAS has become more determined to wrest back that seat whilst retaining its present Permatang Pasir state seat, also on the mainland. Anwar also welcomed the idea of DAP fielding Malay candidates in Penang although he saw no reason to prove to BN that the party was indeed multiracial. “DAP has never considered itself to be a non-Malay party and if it wants to field Malay candidates here, I welcome that. They have done in the past. It is not something new. For instance, (the late) Ahmad Nor contested Bayan Baru in 1990. “Perhaps there would be a slight increase of Malay seat allocations by DAP here, Johor, Pahang, Negeri Sembilan. In fact, PKR has also fielded Chinese, Indian, Dayak or Kadazan candidates. “The issue of candidates is decided by the respective parties but we keep each other informed. For instance, Mansor would have to brief Lim as leader of PR in the state about PKR candidates. “Similarly, (DAP national adviser) Lim Kit Siang would signal to me about one or two candidates in other states and to firm up the candidature. That is the spirit of comradeship there. I may lobby for someone but I won’t influence the party,” Anwar said.